Making this measurement is known as sighting the object, shooting the object, or taking a sight and it is an essential part of celestial navigation. The angle, and the time when it was measured, can be used to calculate a position line on a nautical or aeronautical chart. 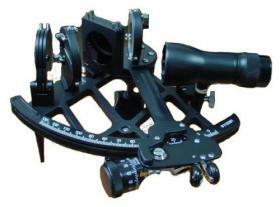 Common uses of the sextant include sighting the sun at solar noon and sighting Polaris at night, to find one's latitude (in northern latitudes). A sextant can also be held horizontally to measure the angle between any two landmarks which allows for calculation of a position on a chart. A sextant can also be used to measure the Lunar distance between the moon and another celestial object (e.g., star, planet) in order to determine Greenwich time which is important because it can then be used to determine the longitude.